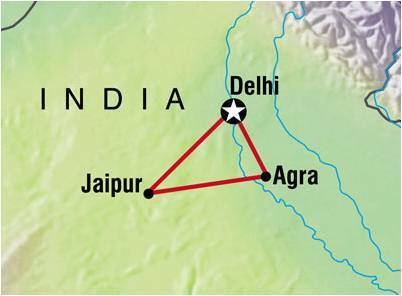 When you’re visiting the North of India, it’s highly recommended that you include the Golden Triangle – Delhi, Agra and Jaipur. A trip to all three can take 7-8 days or more, depending on your itinerary. A famous tourist circuit, the Triangle uses Delhi as a focal point, often starting and ending there. Trains, roads and flights connect all three cities, letting tourists cover the maximum ground with the minimum fuss. With an overview of India’s cultural and historical gems, the Golden Triangle gives tourists a comprehensive glimpse of India’s many facades. In this article, I will talk about Delhi and will cover Agra and Jaipur in next series. Start your journey with India’s capital. Get a sense of the landscape and visit popular historical landmarks like the Qutub Minar, the India Gate, Akshardham temple and the Bahai Temple – and get a sense of India and its heritage, its staggering age, its religions and tolerance. Try different cuisines in Old Delhi, from juicy Mughlai meats to wholly vegetarian feast. Finish your meals with delicious Indian sweets. Stop by the nearby Red Fort and marvel at its resilience. Then, relax and shop at the many boutiques or mall in Delhi- especially at Khan Market, Hauz Khas and GK Market. In the evening, head to Nizamuddin Dargah for a spritual end to the evening. Other must-sees include Safdarjung’s tomb, built to honor a Mughal minister. Stroll in the Lodhi Gardens and breathe in fresh air, redolent with history. Remember, Delhi is a magical place with centuries of being the capital of the country of art, culture and cuisine. Madame Tussauds is in Delhi Now &#8211; Know all about it here!! Stay connected with us for the next destination of the Golden triangle.